Below you will find free and detailed PDF gypsy jazz transcriptions of some of my favourite contemporary gypsy jazz / Jazz Manouche guitar players. These gypsy jazz transcriptions were completed with the goal of furthering my knowledge of and proficiency in playing this wonderful guitar style. I’m happy to share them with you. However, please remember that there is no substitute for completing your own transcriptions. The knowledge and proficiency acquired by your ears and fingers through transcribing is invaluable. 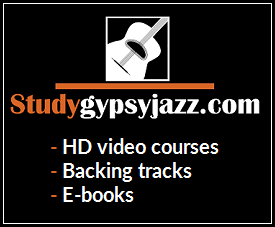 If you would like to learn to play gypsy jazz guitar, please consider checking out my online school, which features thorough and accessible courses in gypsy jazz, as well as useful downloadable backing tracks, a chord vocabulary book, and an arpeggio vocabulary book.